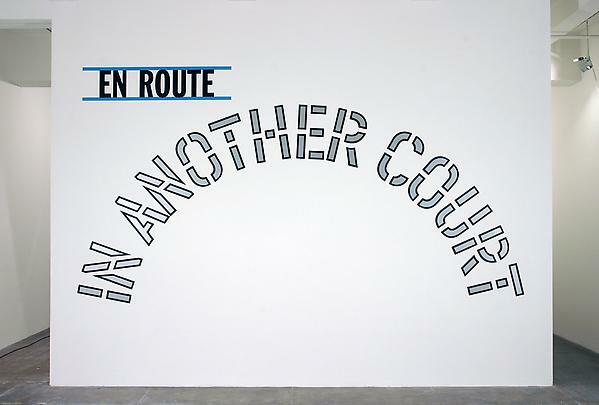 Marian Goodman Gallery is pleased to announce a new exhibition of works by Lawrence Weiner, titled EN ROUTE. 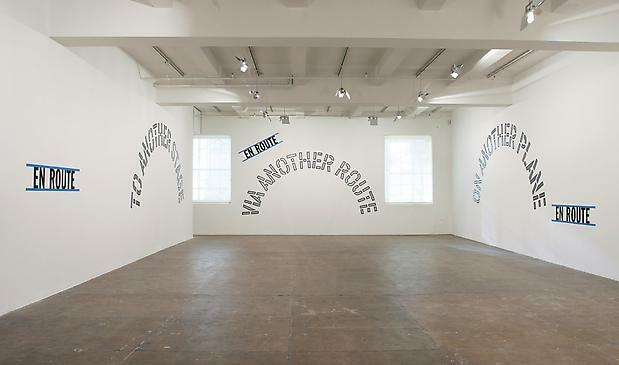 The reception will also launch his newly published monograph, HAVING BEEN SAID: WRITINGS AND INTERVIEWS OF LAWRENCE WEINER 1968-2003*. The exhibition will be open to the public from Thursday, February 24 through April 2nd. Gallery hours are Monday through Saturday, 10am to 6pm. 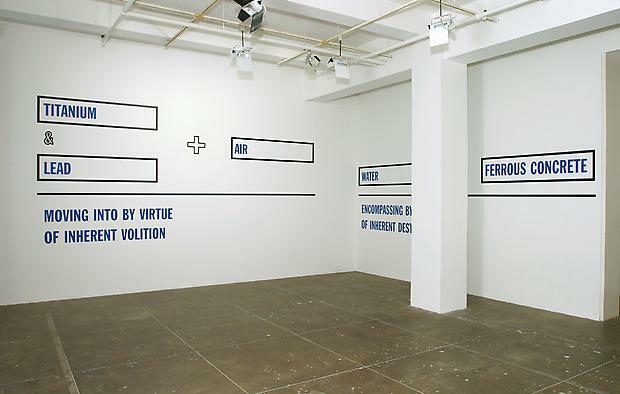 Lawrence Weiner's abiding concern in his art has been with the relationship of human beings to objects, and objects to objects in relation to human beings, within the realm of the use of universal and communal materials. EN ROUTE (2005) is a new work in this series. This work, in the North Gallery, explores chance transitions within space, and the relations of simultaneous and parallel realities. Collage/drawings that hang in the corridor linking the North and South Galleries offer more subject matter on the permutations of simultaneous and parallel realities. Counterpoint to EN ROUTE, works in the adjacent North Gallery Viewing Room and the South Gallery date from 1993 and 1992 respectively. These earlier works comprise issues of chemical and material interaction - from a work that is a simple game of cause and effect to four pieces about inherent destiny of complex painterly interrelationships. 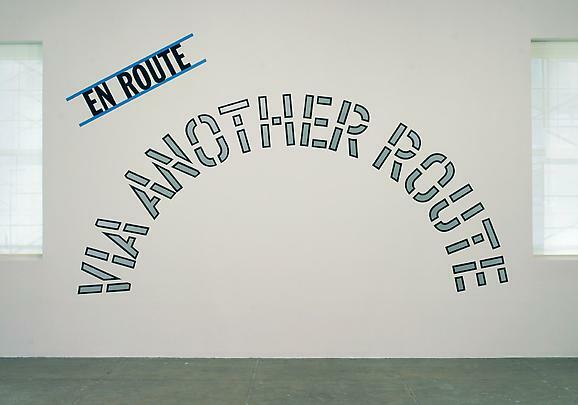 Lawrence Weiner began his career as an artist as a very young man at the height of Abstract Expressionism. His debut public work/exhibition was at the age of 19, with what he called "Cratering Piece." An action piece, the work consisted of explosives set to ignite simultaneously in the four corners of a field in Marin County, California. That work, as Weiner later developed his practice as a painter, became an epiphany for the turning point in his career. Disappointed with the limitations of painting, he realized that sculpture, especially in the 1960s context of Minimal Art, opened infinite possibilities. 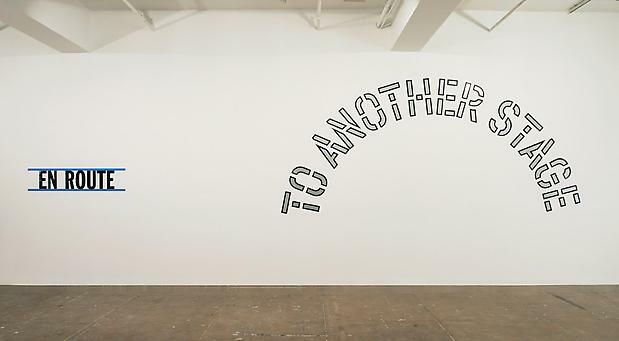 That original field in California, with its exploded/imploded corners began a fertile exploration of new material and expressions when language became the prime vehicle for Weiner's work in 1968. Sculpture based on language and materials made possible Weiner's strong commitment to making his work accessible to the public. Over the years, the work has been incorporated into film, video, records, cds, dvds, posters, books as well as more traditional multiples and editions. Solo exhibitions and projects in 2004 include Covered By Clouds/Cubierto Por Nubes at Museo Tamayo Arte Contemporáneo in Mexico City, curated by Lynne Cooke; a project, Primary Secondary Tertiary in Massachusetts at the Davis Museum and Cultural Center, Wellesley; and the inauguration of a permanent public sculpture at Never Jungfernsteig, in Hamburg this past Fall. 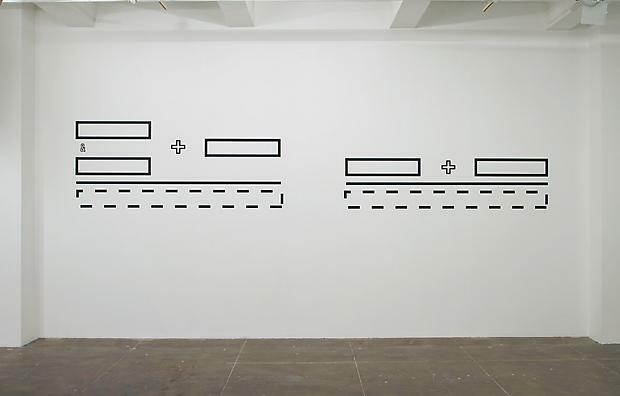 Recent group exhibitions include A Minimal Future? Art As Object 1958-1968 (curated by Ann Goldstein) at MOCA, Los Angeles; Beyond Geometry: Experiments in Form, 1940's-1970's in California at The Modern and Contemporary Art Council of the Los Angeles County Museum of Art, LACMA Times Central Court (traveled to the Miami Art Museum, Miami); and Infinite Possibilities, Serial Imagery in 20th-Century Drawings at the Davis Museum and Cultural Center, Wellesley, MA; and the inaugural exhibition at The Museum of Modern Art, the reinstallation of the Collection in the Contemporary Galleries, which opened this past Fall. Surveys of Weiner's work have been held at the Van Abbemuseum, 1976; Kunsthalle Bern, 1983; Stedelijk Museum, Amsterdam, 1988; and Le Nouveau Musée/Institut d'Art Contemporain, Villeurbanne, 1994 . A survey exhibition of his multiples was held at Boijmans van Beunigen Museum, Rotterdam in 1996, and a survey of his printed work was shown at The New York Public Library in 1995. 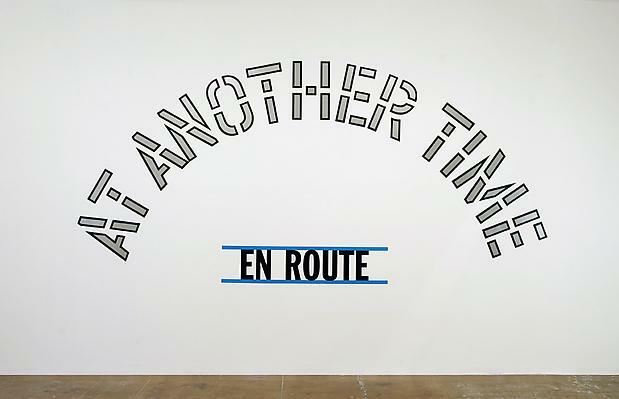 The Vancouver Art Gallery has maintained The Lawrence Weiner Poster Archive since 1986. It has been shown extensively in the United States and Europe, with forthcoming venues in Australia. 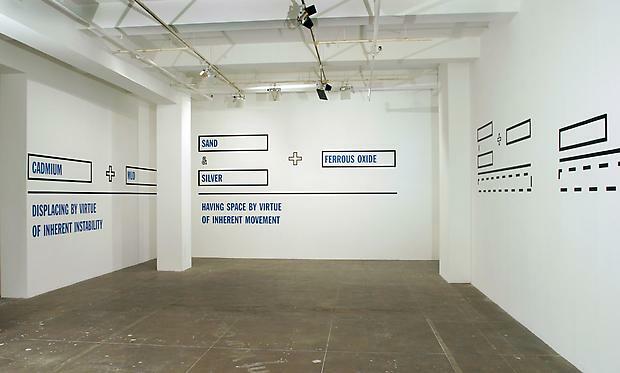 Lawrence Weiner has been the recipient of the Skowhegan Medal for Painting/Conceptual Art; the Wolfgang Hahn Prize, Ludwig Museum; two NEA Fellowships and the Arthur Köpcke Prize, Arthur Köpcke Memorial Fund, Copenhagen Denmark as well as receiving support for film productions from The Netherlands Film Board and DAAD Berlin. His public projects and commissions range from a Public Art Fund project in collaboration with Con Edison and Roman Stone that integrated an edition of 19 cast-iron manhole cover/sculptures by Weiner on to Con Edison's New York City grid, to an intervention of the work stenciled on ancient support walls in the City of Paris in Les Tuilleries . 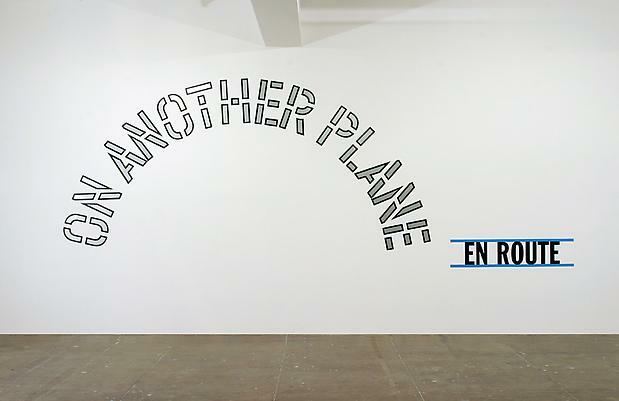 *HAVING BEEN SAID: WRITINGS AND INTERVIEWS OF LAWRENCE WEINER 1968-2003, edited by Gerti Fietzek and Gregor Stemmrich will be available during the course of the exhibition. The book brings together published writings, many of them out of print articles, essays and interviews, as well as transcripts of symposia, media. Exhaustively researched and edited, it includes an annotated index and bibliography. Taken as a whole, the chronologically arranged texts afford insight into Weiner's complex individual biography and the part he has played in the wider development of art and culture.